Meditation, in its simplest terms, refers to learning how to pay attention. When used properly, meditation allows you to slow down and observe the world without judgment. If you live with generalized anxiety disorder (GAD), it can also help to reduce worrying thoughts and bring about a feeling of balance, calm and focus. For the 6.8 million Americans who live with chronic daily anxiety, meditation can offer a way to finally relax. Meditation has its roots in Buddhist philosophy. When you think of meditation, it probably conjures up images of a room full of people sitting cross-legged and chanting the same word repeatedly. Popularized by celebrities, transcendental meditation (TM) is one form of meditation that has the goal of helping you enter a deep state of relaxation or a state of restful alertness. Because meditation helps to reduce stress and fatigue, its helpfulness for those with generalized anxiety disorder -- who suffer with chronic anxiety and often insomnia -- is easy to comprehend. The concepts of meditation and mindfulness are very similar. While meditation typically involves trying to enter a different state of consciousness, mindfulness means becoming aware of the present moment. In this way, you might think of mindfulness as one step on the path toward meditation. Both of these practices may be helpful for reducing anxiety because they enable you to reduce worry and be aware without being fearful. Meditation used in the treatment of anxiety disorders typically takes the form of mindfulness-based meditation. 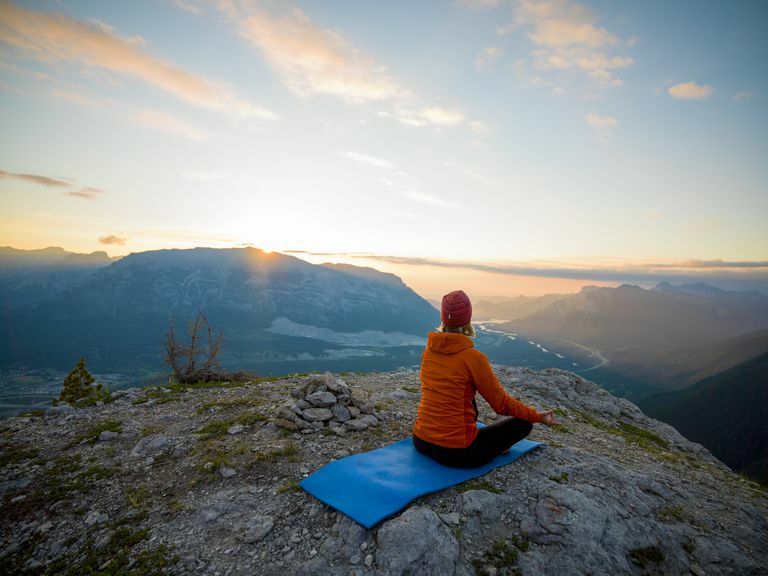 This type of meditation has its roots in the mindfulness movement started by Jon Kabat-Zinn, founder of the mindfulness-based stress reduction (MBSR) approach. The basic premise of this approach is to learn to detach from anxious thoughts. This is achieved by practicing awareness, identifying tension in the body, understanding your thinking patterns, and learning how to deal with difficult emotions. MBSR is typically practiced with an instructor, but there are also online courses that you can take such as the free one offered by Palouse Mindfulness. Research support for the benefits of meditation for generalized anxiety disorder has been positive. A 2013 randomized controlled trial was conducted with 93 individuals with DSM-IV diagnosed GAD comparing an 8-week manualized mindfulness-based stress reduction (MBSR) group program with an attention control (stress management education, or SME). MBSR was associated with significantly greater reductions in anxiety for three of the four study measures. Participants also showed a greater increase in positive self-statements. Additionally, a 2012 meta-analysis indicated strong support for mindfulness meditation for anxiety. If you're living with generalized anxiety, practicing daily meditation may help you to overcome anxiety and reduce tension in your body. If you've ever taken a yoga class, you are well on your way to practicing meditation. You don't need a lot of time to meditate—initially, try to carve out a few minutes each day. You can gradually increase that time as you learn how to relax and what it feels like to be calm. Sit upright in a chair, and place your feet flat on the floor. Begin paying attention to your breath. Don't try to change how you are breathing; simply observe your body as you inhale and exhale. You might feel compelled to shift your focus elsewhere. Resist this urge and continue to focus on your breathing. Anxious thoughts may pass through your mind. Acknowledge them, but then bring yourself back to awareness of your breathing. Continue this quiet, nonjudgmental observation for about 10 minutes. Open your eyes and notice how you feel. Don't evaluate, just observe. The key to learning to practice meditation is to accept the world around you from a place of curious observation. This meditative practice may soon spill into other areas of your life, as you notice yourself observing rather than reacting during difficult situations or times of worry. GAD primarily involves unrelenting worry—if you can learn to accept those worries without letting them upset you, then your distress is likely to diminish. There are many reasons why you might find it hard to meditate or be mindful. You might have trouble observing without judging or you may feel impatient or as though there is "too much to do" to be sitting around breathing. Some people have trouble doing nothing, as they are used to always being on the go. Other times, you might find that you can't stop the negative thoughts from intruding as you try to relax. Recognize that this will take time. Don't expect your first meditation session to be easy. As silly as it may sound, it takes practice to learn how to do nothing. Eventually, it will come easier. Make time. Just as this will take time, you need to make time for it. Schedule it into your day just like your job or an appointment. Don't make it an option not to practice; tell yourself that you just need to get it done. Sometimes, when you've got too much to do and can't fit in time for a quiet moment, you may find afterward that the quiet moment helped you to return to your day more centered and better at problem-solving. Were you able to observe your anxious thoughts without judging them? Did you achieve a state of focused observation? Keep a journal to track your progress and note if your anxiety is reduced. If, over time, you still face troubling anxiety that is chronic and severe, be sure to talk with your doctor about treatment options. Hoge EA, Bui E, Marques L, et al. Randomized Controlled Trial of Mindfulness Meditation for Generalized Aanxiety Disorder: Effects on Anxiety and Stress Reactivity. J Clin Psychiatry. 2013;74(8):786-792. doi: 10.4088/JCP.12m08083. Lu C-F, Smith LN, Gau C-H. Exploring the Zen meditation experiences of patients with generalized anxiety disorder: a focus-group approach. J Nurs Res. 2012;20(1):43-51. doi: 10.1097/JNR.0b013e3182466e83. National Institute of Mental Health. Generalized Anxiety Disorder. Sarris J, Moylan S, Camfield DA, et al. Complementary Medicine, Exercise, Meditation, Diet, and Lifestyle Modification for Anxiety Disorders: A Review of Current Evidence. Evid Based Complement Alternat Med. 2012;2012:809653. doi: 10.1155/2012/809653. Transcendental Meditation. Eat, Meditate, Exercise - Treating Anxiety Naturally.